One of the features that can come in handy is Aero Shake. If you’re moving fast, sometimes you accidentally minimize all open windows. That’s annoying. 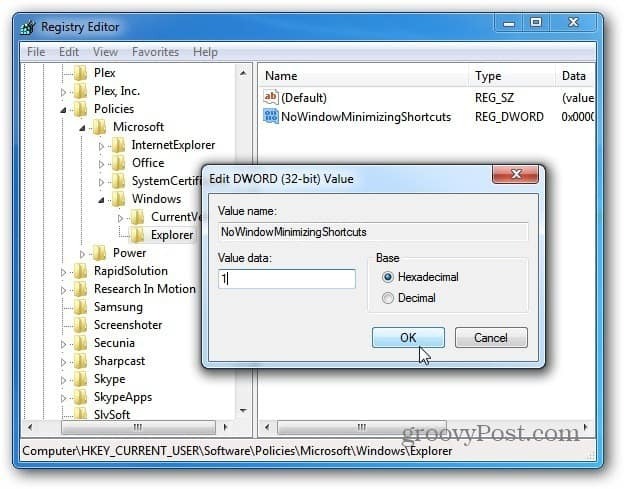 Here’s how to disable the Aero Shake feature in Windows 7 and 8 with a Registry tweak. Click and hold the title bar and shake it left and right. 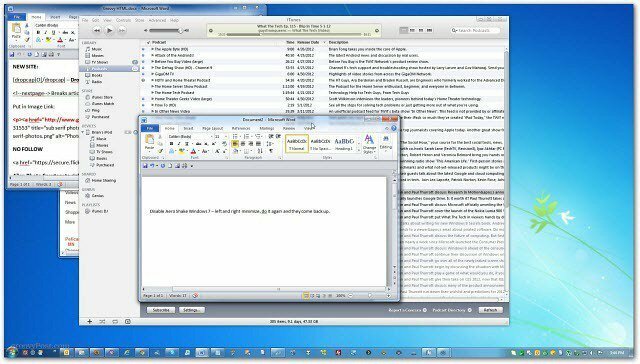 Then all other windows that are open will be minimized. Note: Before making any tweaks to the Windows Registry, make sure you back it up. First, click Start and Type: regedit in the Search box and hit Enter. The Registry Editor opens. 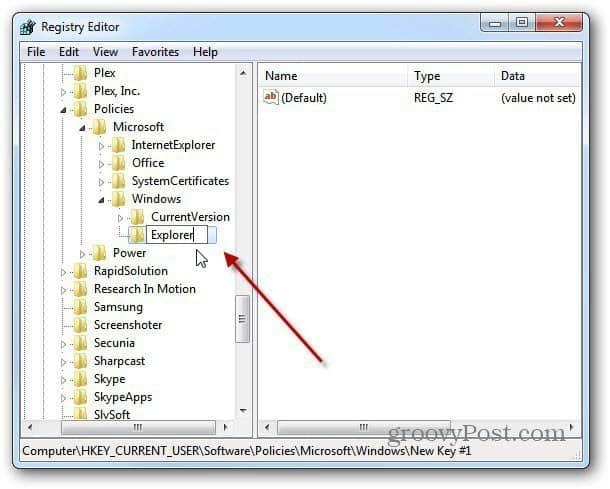 Navigate to HKEY_CURRENT_USER\Software\Policies\Microsoft\Windows. 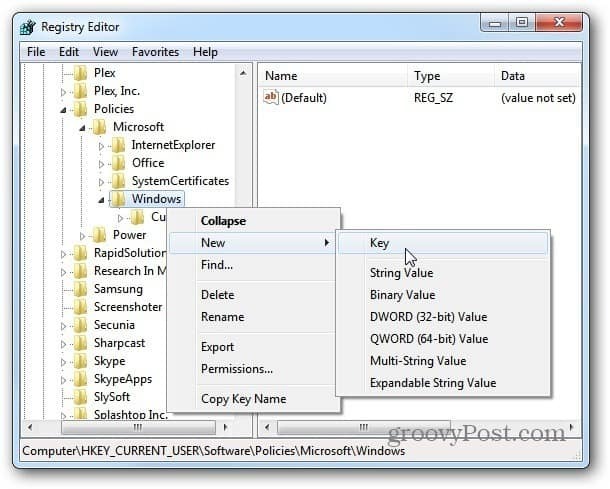 Right click on Windows >> New >> Key. Name the new key Explorer. 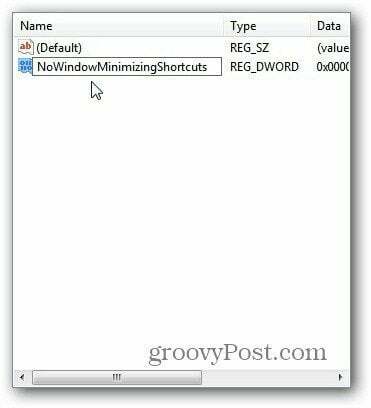 Now right click an empty area in the right pane. Select New >> DWORD (32-bit) Value. Now right click the new DWORD Value you just created and select Modify. Change the Value Data field to 1 and click OK.
Now, log off your system and log back on and Aero Shake is disabled. You can Restart your system, but don’t need to, just log off and back on again. 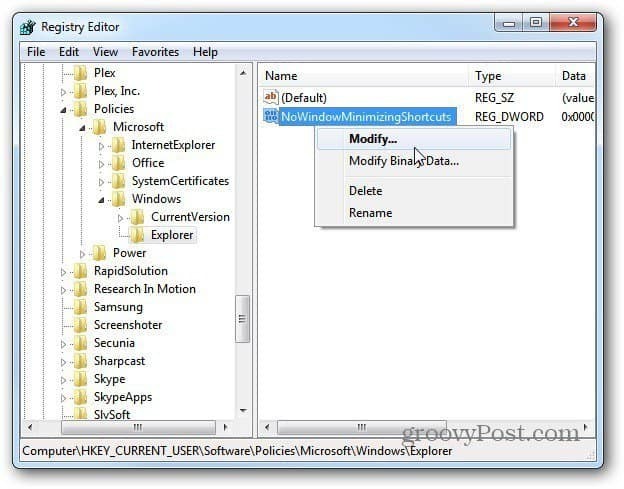 This Registry hack also works in Windows 8 Consumer Preview. This is good, also works in Windows 8. I wish Microsoft would keep settings in an ini file, that way I can keep settings from previous versions of Windows, and easily backup/restore/modify windows settings instead of digging in the registry. 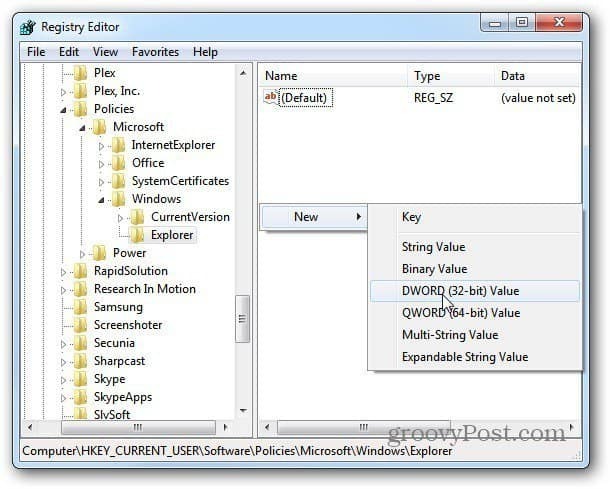 If the settings files where versioned, for instance if a new Windows release was incompatible with old settings files, it would be called ExplorerSettings1.ini for Windows 7, and ExplorerSettings2.ini for Windows 8 and upgrades from one Windows to the next would be really simple. It would also be possible to mount/junction a single folder like G:\Users\Username and you would have all files, settings and appdata instantly restored instead of defining each folder, and still miss out on all your email and whatnot that is stored in AppData. This is why I prefer Thunderbird over Outlook. 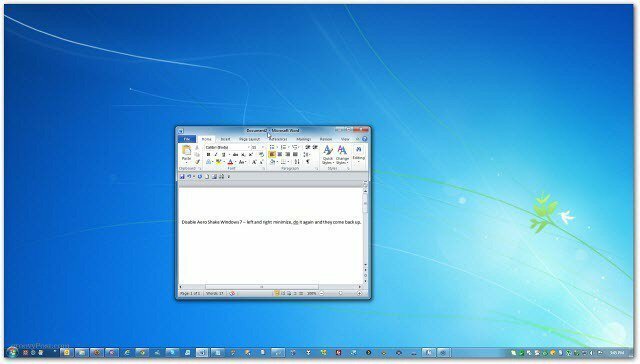 If I wanto use the settings and email in different OS’s, for instance Windows 7 and Windows 8 CP, I can simply point to the profile folder. If I used outlook, I would have to import and export everytime I upgrade windows or reinstall as Outlook also uses the registry for settings and userdata is a really nasty way. With Thunderbird I just move the profile folder into the AppData on the new install, and everything is there. This works with Opera, Firefox and Steam, and really shows how bad some of Microsofts programming have been. Maybe they did it on purpose to make reverse engineering more difficult? This tweak has never worked for me. I’ve checked it numerous times to be sure I have it exactly correct. It has absolutely no effect on Aero Shake. I don’t have gpedit.msc on this version of Windows 8.1(Home), so I can’t use that.